"My dog just tried to bite me! All I did was tell him to move over so I could sit on the couch next to him." "My dog got into the trash can and when I scolded her, she growled at me. What's wrong with her? I thought she loved me!" "Our dog is very affectionate most of the time but when we try to make him do something he doesn't want to do, he snaps at us." What do these three dogs have in common? Are they nasty or downright vicious? No, they're "alphas." They've taken over the leadership of the families that love them. Instead of taking orders from their people, these dogs are giving orders. Your dog can love you very much and still try to dominate you or other members of your family. Dogs are social creatures and believers in social order. A dog's social system is a "pack" with a well-defined pecking order. The leader of the pack is the alpha, supreme boss, Top Dog. He (or she) gets the best of everything—the best food, the best place to sleep, the best toy, etc. The leader also gets to be first in everything—he gets to eat first, to leave first and to get attention first. All the other dogs in the pack respect the alpha dog's wishes. Any dog that challenges the alpha's authority gets a swift physical reminder of just where his place in the pack really is. Your family is your dog's "pack." Many dogs fit easily into the lower levels of their human pack's pecking order and don't make waves. They do what they're told and don't challenge authority. Other dogs don't fit in quite as well. Some of them are natural born leaders and are always challenging their human alphas. Other dogs are social climbers; they're always looking for ways to get a little closer to the top of the family ladder. These natural leaders and the social climbers can become problems to an unsuspecting family that's not aware of the dog's natural pack instincts. Some families encourage their dogs to take over the "pack" without realizing it. They treat their dogs as equals, not as subordinates. They give them special privileges like being allowed to sleep on the bed or couch. They don't train their dogs and let them get away with disobeying commands. In a real dog pack, no one but the alpha dog would get this kind of treatment. Alpha doesn't have anything to do with size. The tiniest Chihuahua can be a canine Hitler. In fact, the smaller the dog, the more people tend to baby them and cater to it, making the dog feel even more dominant and in control of his humans. Alpha dogs often seem to make good pets. They're confident, smarter than average, and affectionate. They can be wonderful with children and good with strangers. Everything seems to be great with the relationship—until someone crosses him or makes him do something he doesn't want to do. Then, suddenly, this wonderful dog growls or tries to bite someone and no one understands why. In a real dog pack, the alpha dog doesn't have to answer to anyone. No one gives him orders or tells him what to do. The other dogs in the pack respect his position. 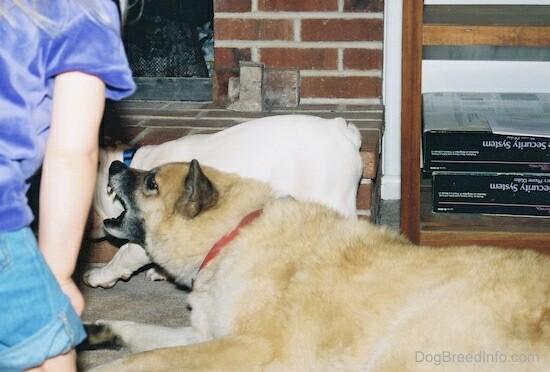 If another dog is foolish enough to challenge the alpha by trying to take his bone or his favorite sleeping place, the alpha dog will quickly put him in his place with a hard stare or a growl. If this doesn't work, the alpha dog will enforce his leadership with his teeth. This is all-natural, instinctive behavior—in a dog's world. In a human family, though, this behavior is unacceptable and dangerous. Dogs need and want leaders. They have an instinctive need to fit into a pack. They want the security of knowing their place and what's expected of them. Most of them don't want to be alphas; they want someone else to give the orders and make the decisions. If his humans don't provide that leadership, the dog will take over the role himself. If you've allowed your dog to become alpha, you're at his mercy and as a leader, he may be either a benevolent king or a tyrant. If you think your dog is alpha in your household, he probably is. If your dog respects only one or two members of the family but dominates the others, you still have a problem. The dog's place should be at the bottom of your human family's pack order, not at the top or somewhere in between. In order to reclaim your family's rightful place as leaders of the pack, your dog needs some lessons in how to be a subordinate, not an equal. You're going to show him what it means to be a dog again. Your dog's mother showed him very early in life that she was alpha and that he had to respect her. As a puppy, he was given a secure place in his litter's pack and because of that security, he was free to concentrate on growing, learning, playing, loving and just being a dog. Your dog doesn't really want the responsibility of being alpha, having to make the decisions and defend his position at the top. He wants a leader to follow and worship so he can have the freedom of just being a dog again. Your dog watches you constantly and reads your body language. He knows if you're insecure, uncomfortable in a leadership role or won't enforce a command. This behavior confuses him, makes him insecure and if he's a natural leader or has a social-climbing personality, it'll encourage him to assume the alpha position and tell you what to do. "Alpha" is an attitude. It involves quiet confidence, dignity, intelligence, and an air of authority. A dog can sense this attitude almost immediately; it's how his mother acted towards him. Watch a professional trainer or a good obedience instructor. They stand tall and use their voices and eyes to project the idea that they're capable of getting what they want. They're gentle but firm, loving but tough, all at the same time. Most dogs are immediately submissive towards this type of personality because they recognize and respect alpha when they see it. Practice being alpha. Stand up straight with your shoulders back. Walk tall. Practice using a new tone of voice, one that's deep and firm. Don't ask your dog to do something—tell him. There's a difference. He knows the difference, too. Remember that, as alpha, you're entitled to make the rules and give the orders. Your dog understands that instinctively. With most dogs, just this change in your attitude and an obedience training course will be enough to turn things around. With a dog that's already taken over the household and has enforced his position by growling or biting and has been allowed to get away with it, you'll need to do more than just decide to be alpha. The dog is going to need an attitude adjustment as well. Natural leaders and social climbers aren't going to want to give up their alpha position. Your sudden change in behavior is going to shock and threaten them. Your dog might act even more aggressively than before. An alpha dog will instinctively respond to challenges to his authority. It's his nature to want to put down revolutionary uprisings by the peasants. Don't worry, there's a way around it. An alpha dog already knows that he can beat you in a physical fight so returning his aggression with violence of your own won't work. Until you've successfully established your position as alpha, corrections like hitting, shaking, or using the "rollover" techniques described in some books will not work and can be downright dangerous to you. An alpha dog will respond to these methods with violence and you could be seriously hurt. What you need to do is use your brain. You're smarter than he is and you can out-think him. You'll also need to be more stubborn than he is. What I'm about to describe here is an effective, non-violent method of removing your dog from alpha status and putting him back at the bottom of the family totem pole where he belongs and where he needs to be. In order for this method to work, your whole family has to be involved. It requires an attitude adjustment from everyone and a new way of working with your dog. This is serious business. A dog that bites or threatens people is a dangerous dog, no matter how much you love him. If treating your dog like a dog and not an equal seems harsh to you, keep in mind that our society no longer tolerates dangerous dogs. Lawsuits from dog bites are now settling for millions of dollars; you could lose your home and everything else you own if your dog injures someone. You or your children could be permanently disfigured. And your dog could lose his life. That's the bottom line. From this day forward, you're going to teach your dog that he is a dog, not a miniature human being in a furry suit. His mother taught him how to be a dog once and how to take orders. Along the way, through lack of training or misunderstood intentions, he's forgotten. With your help, he's going to remember what he is and how he fits into the world. Before long, he's even going to like it. Dogs were bred to look to humans for food, companionship and guidance. An alpha dog doesn't ask for what he wants, he demands it. He lets you know in no uncertain terms that he wants his dinner, that he wants to go out, that he wants to play and be petted and that he wants these things right now. You're going to teach him that from now on, he has to earn what he gets. No more free rides. This is going to be a shock to his system at first but you'll be surprised how quickly he'll catch on and that he'll actually become eager to please you. If your dog doesn't already know the simple command “sit,” teach it to him. Reward him with praise and a tidbit. Don't go overboard with the praise. A simple "Good boy!" in a happy voice is enough. Now, every time your dog wants something—his dinner, a trip outside, a walk, some attention, anything—tell him (remember don't ask him, tell him) to SIT first. When he does, praise him with a "Good Boy!" then tell him OKAY and give him whatever it is he wants as a reward. If he refuses to SIT, walk away and ignore him. No SIT, no reward. If you don't think he understands the command, work on his training some more. If he just doesn't want to obey, ignore him; don't give him what he wants or reward him in any fashion. Make him sit before giving him his dinner, make him sit at the door before going outside, make him sit in front of you to be petted, make him sit before giving him his toy. If you normally leave food out for him all the time, stop. Go to a twice-daily feeding and you decide what time of day he'll be fed. Make him sit for his dinner. If he won't obey the command, no dinner. Walk away and ignore him. Bring the food out later and tell him again to SIT. If he understands the command, don't tell him more than once. He heard you the first time. Give commands from a standing position and use a deep, firm tone of voice. If the dog respects certain members of the family but not others, let the others be the ones to feed him and bring the good things to his life for now. Show them how to make him obey the SIT command and how to walk away and ignore him if he won't do as he's told. It's important that your whole family follows this program. Dogs are like kids; if they can't have their way with Mom, they'll go ask Dad. In your dog's case, if he finds a member of the family that he can dominate, he'll continue to do so. You want your dog to learn that he has to respect and obey everyone. Remember, his place is at the bottom of the totem pole. Bouncing him from the top spot helps, but if he thinks he's anywhere in the middle, you're still going to have problems. Think, you know your dog and know what he's likely to do under most circumstances. Stay a step ahead of him and anticipate his behavior so you can avoid or correct it. If he gets into the trash and growls when scolded, make the trash can inaccessible. If he likes to bolt out the door ahead of you, put a leash on him. Make him sit and wait while you open the door and give him permission—“OKAY!”—to go out. If your alpha dog doesn't like to come when he's called (and he probably doesn't), don't let him outside off-leash. Without a leash, you have no control over him and he knows it. Alpha dogs are used to being fussed over. In a real dog pack, subordinate dogs are forever touching, licking and grooming the alpha dog. It's a show of respect and submission. For now, until his attitude has shown improvement, cut down on the amount of cuddling your dog gets. When he wants attention, make him SIT first, give him a few kind words and pats, then stop. Go back to whatever it was you were doing and ignore him. If he pesters you, tell him “NO!” in a firm voice and ignore him some more. Pet him when you want to, not just because he wants you to. Also, for the time being, don't get down on the floor or on your knees to pet your dog. That, too, is a show of submission. Give praise, petting and rewards from a position that's higher than the dog. If you or anyone in your family wrestles, rough-houses or plays tug-of-war with your dog, stop. These games encourage dogs to dominate people physically and to use their teeth. In a dog pack or in a litter, these games are more than just playing; they help to establish pack order based on physical strength. Your dog is already probably stronger and quicker than you are. Rough, physical games prove that to him. He doesn't need to be reminded of it. Find new games for him to play. Hide & seek, fetch or Frisbee-catching are more appropriate. Make sure you're the one who starts and ends the game, not the dog. Stop playing before the dog gets bored and is inclined to try to keep the ball or Frisbee. Not in your bedroom and especially not on your bed. Your bedroom is a special place, it's your "den." An alpha dog thinks he has a right to sleep in your den because he considers himself your equal. In fact, he may have already taken over your bed, refusing to get off when told or growling and snapping when anyone asks him to make room for the humans. Until your dog's alpha problems are fully under control, the bedroom should be off-limits. The same goes for sleeping on furniture. If you can't keep him off the couch without a fight, deny him access to the room until his behavior and training has improved. Dog crates have 1,000 uses and working with an alpha dog is one of them. It's a great place for your dog to sleep at night, to eat in and just to stay in when he needs to chill out and be reminded that he's a dog. The crate is your dog's "den." Start crate-training by feeding him his dinner in his crate. Close the door and let him stay there for an hour afterwards. If he throws a tantrum, ignore him. Don't let your dog out of his crate until he's quiet and settled. At bedtime, show him an irresistible goodie, tell him to SIT and when he does, throw the goodie into the crate. When he dives in for the treat, tell him what a good boy he is and close the door. Graduating from Boot Camp: What's next? Just like in the army, boot camp is really just an introduction to a new career and new way of doing things. A tour through boot camp isn't going to solve your alpha dog's problems forever. It's a way to get basic respect from a dog that's been bullying you without having to resort to physical force. How long should boot camp last? That depends on the dog. Some will show an improvement right away, others may take much longer. For really tough cookies, natural leaders that need constant reminders of their place in the pack, Alpha Dog Boot Camp will become a way of life. Social climbers may need periodic trips through boot camp if you get lax and accidentally let them climb back up a notch or two in the family pack order. How do you know if you're making a difference? If boot camp has been successful, your dog should start looking to you for directions and permission. He'll show an eagerness to please. Watch how your dog approaches and greets you. Does he come to you "standing tall," with his head and ears held high and erect? It may look impressive and proud but it means he's still alpha and you still have problems. A dog that accepts humans as superiors will approach you with his head slightly lowered and his ears back or off to the sides. He'll "shrink" his whole body a little in a show of submission. Watch how he greets all the members of the family. If he displays this submissive posture to some of them, but not others, those are the ones who still need to work on their own alpha posture and methods. They should take him back through another tour of boot camp with support from the rest of the family. Once your dog has begun to accept this new way of life and his new position in the family, you should take him through an obedience course with a qualified trainer. All dogs need to be trained and alpha dogs need training most of all. You don't have to wait until he's through with boot camp to start this training but it's important that he respects at least one member of the family and is willing to take direction from them. Obedience class teaches you to train your dog. It teaches you how to be alpha, how to enforce commands and rules, how to get respect and to keep it. All family members who are old enough to understand and control the dog should participate in the class. Obedience training is a lifelong process. One obedience course does not a trained dog make. Obedience commands need to be practiced and incorporated into your daily life. In a dog pack, the alpha animal uses occasional reminders to reinforce his authority. Certain commands, like DOWN/STAY, are especially effective, nonviolent reminders of a dog's place in the family pack order and who's really in charge here. A well-trained, obedient dog is a happy dog and a joy to live with. Dogs want to please and need a job to do. Training gives them the opportunity to do both. A well-trained dog has more freedom. He can go more places and do more things with you because he knows how to behave. A well-trained dog that's secure in his place within the family pack is comfortable and confident. He knows what's expected of him. He knows his limits and who his leaders are. He's free from the responsibility of running the household and making decisions. He's free to be your loving companion and not your boss. He's free to be a dog—what he was born to be and what he always wanted to be in the first place. If your dog has already injured you or someone else or if you are afraid of your dog, you should consult with a qualified professional dog behaviorist before starting Canine Boot Camp. Your dog should also have an exam by your vet to make sure there are no physical causes for his behavior. To find a qualified trainer or behaviorist near you, contact Bark Busters, your veterinarian or the American Kennel Club for a list of obedience training clubs in your area. This article was written by Vicki Rodenberg De Gruy, Chairman of the Chow Chow Club Inc.'s Welfare Committee. Uploaded with permission from the author.